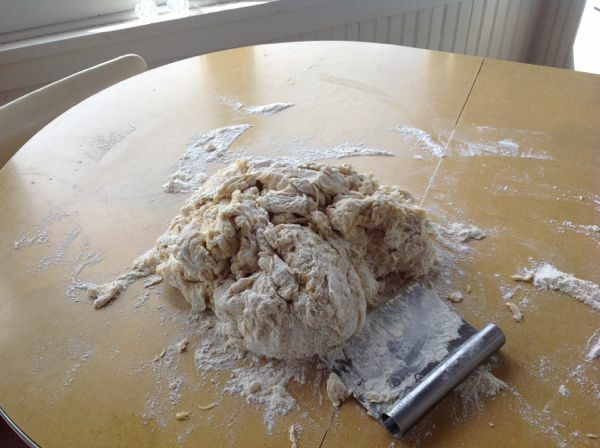 The Torture of Making Easter Bread….er, I mean Joy! 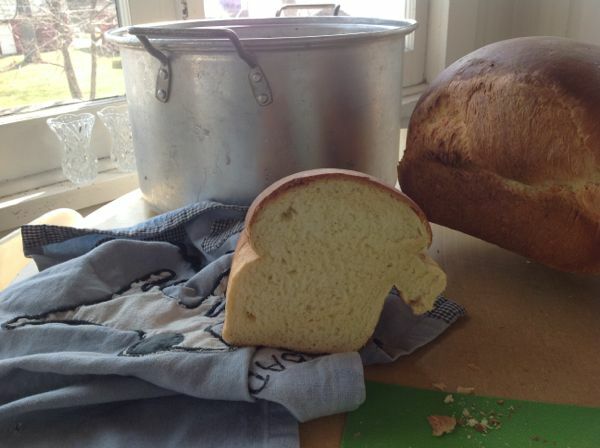 Easter bread, a sorta’ sweet, anise and lemon flavored almost cake-like bread (due to the dozen eggs you use to make six loaves of it) is not a particularly Italian thing, but it is a huge thing in my Italian family. 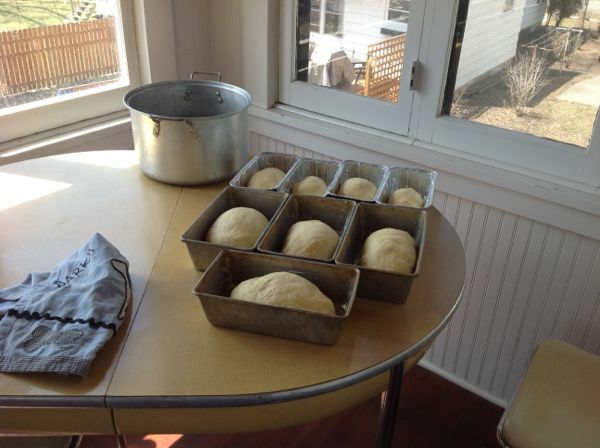 And while all of us in my family have made the bread at some point in their lives, only a few of us do it every. single. year. We’re the crazy ones. It started with my gramma. 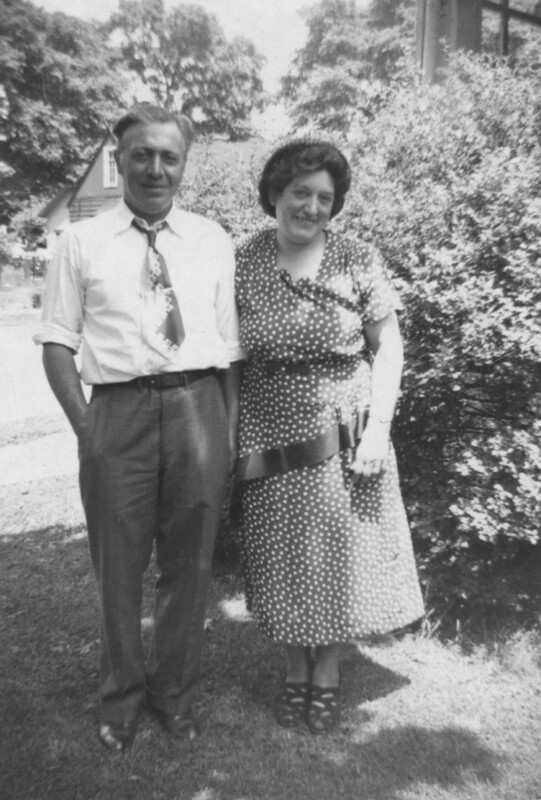 Grampa and Gramma on their 25th wedding anniversary, sometime in the late 1940’s?? Ugh, I’m terrible with dates. Well, it started before her, obviously, but for me, it started with her. She would make the bread the week before Easter and tell her kids that it couldn’t be cut into before Easter or snakes would crawl out of it. But I wouldn’t doubt her and grampa were snarfing down a loaf days before Easter, waiting until after the kids had gone to bed before committing their “sin.” The bread had to be made ahead of time because she would also have to make stuffed artichokes, wedding soup, and easter rice pudding (also super heavy with eggs) in the days before and on the day of, she’d make rosemary roasted chicken and potatoes, spaghetti and meatballs, and a salad with oranges and onions. But it was the Easter bread that was always the epic undertaking that would kick off the Easter cooking frenzy. Like I said, it’s sweet, but you shouldn’t make it too sweet or the yeast will freak out or take too long to rise or or make the loaves too brown. You shouldn’t under sweeten it because it just won’t taste right. (I had an aunt who cheated and substituted some of the sugar with saccharin. Her bread was always perfect. But I still consider it cheating. Her sisters smugly concur.) 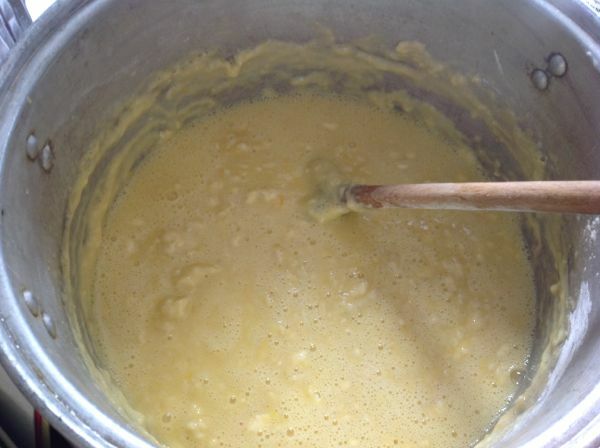 You have to be careful of the temperature of the eggs and the milk when you mix them in. You can’t just dump the lemon juice into the milk without the flour or the milk will curdle. 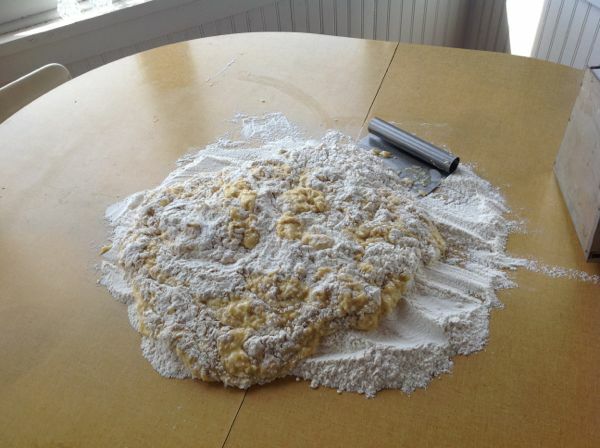 You can’t use too much flour or it will be heavy. 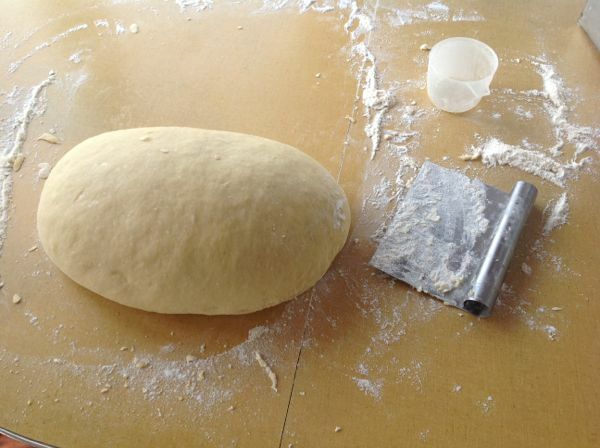 You can’t use too little flour or it will be too cakey and/or fragile. You want it to look “just so” with the right amount of flavor, texture, sweetness and color. My gramma always complained that the modern egg yolks weren’t yellow enough and the light color of the bread would always disappoint her. Sometimes, she would cheat and add a little yellow dye to the batter, which resulted in the occasional batch of orange loaves. And heaven forbid something goes wrong with the yeast. 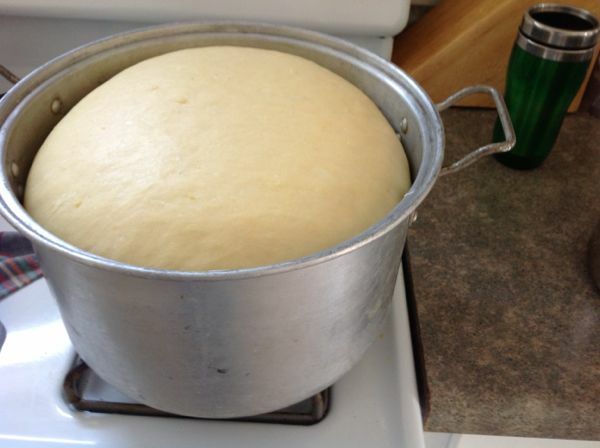 There have been several Easters where my bread didn’t rise or took forever to rise. One year, I had to throw out an entire batch. I let it rise for 24 hours and nothing happened. Another time, the first rise took six or seven hours. 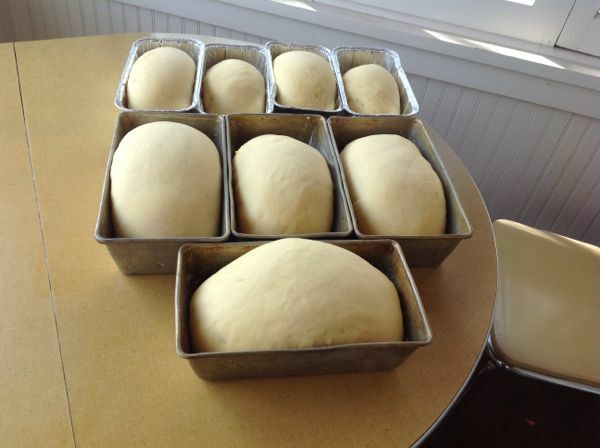 By the time I got it into the loaf pans and allowed for the second rise, I was baking loaves at 4 o’clock in the morning. 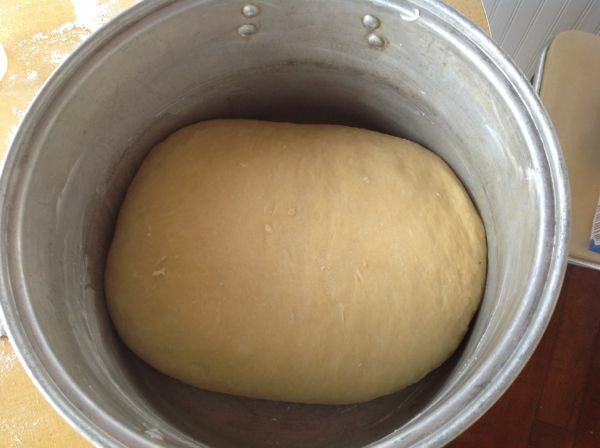 For my part, I talk to my yeast and dough. My gramma always talked to her food when she was preparing it and I suspect that there was a bit of the magic in her. (She also made afghans and I dare anybody to stay awake while being covered by one. It was as if she weaved a relaxation spell into the loops and knots.) I also treat the loaf like it’s a living baby, which it almost seems to be when it’s just been kneaded and is ready for the first rise. It’s the size of a small baby, it’s smooth, it smells good, it’s a little sticky and when you poke it, it springs right back. First, I’ll start off by saying I don’t make this in a gourmet kitchen. 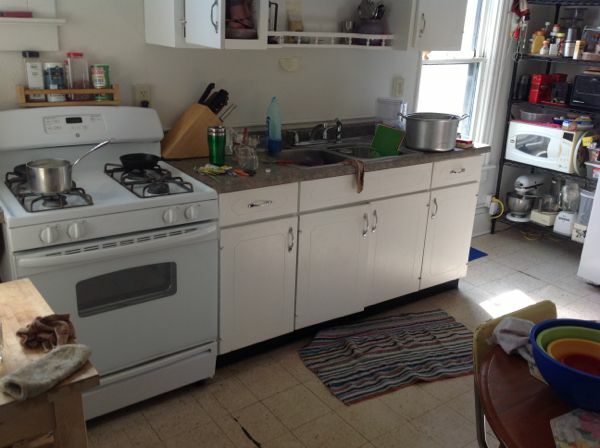 It’s a crappy kitchen in a rental. What you see there is pretty much all the counter space I have. But, since I lived in Brooklyn for 25 years, this seems almost palatial. 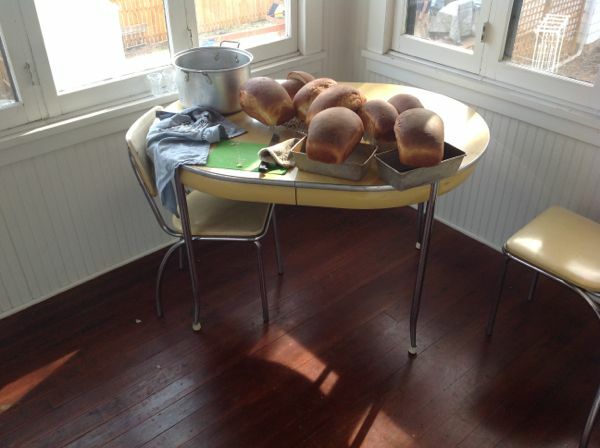 Also I live in Wisconsin now and I am fortunate to have a south-facing porch off my kitchen and if I’m lucky, like I was last year (and again this year) I can make the bread on a warm sunny day and use the porch to work the dough. 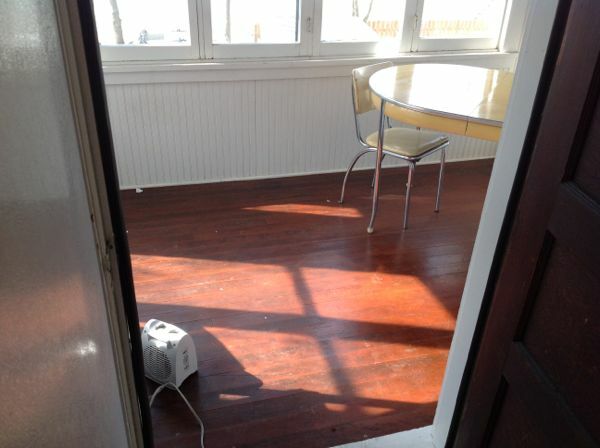 I also give it a little warmth boost with a space heater. See that table? That was my gramma’s table. It’s JUST the right height for kneading! 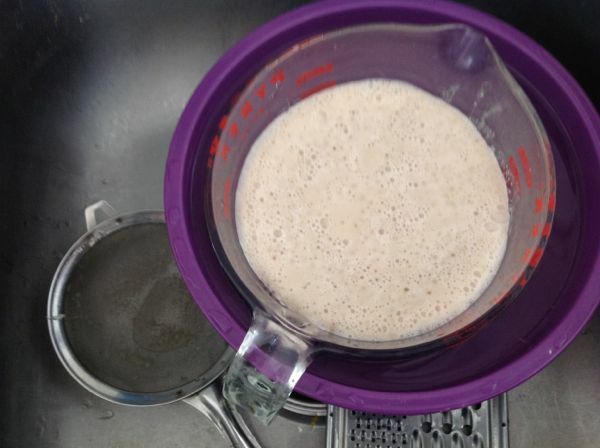 Anyway, I get all the ingredients together and get the yeast started. I use six packets of fast acting yeast so you gotta move quick once you get it going. 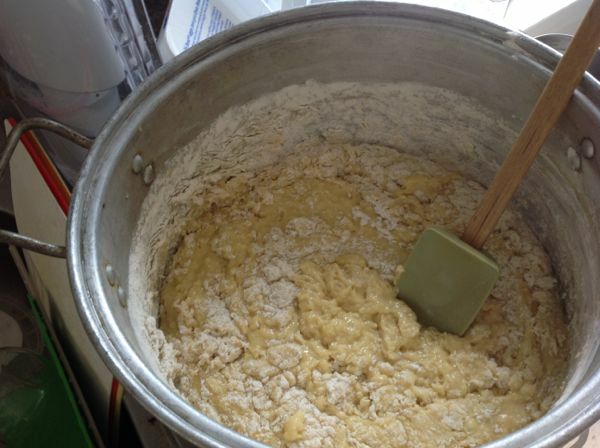 I mix all the wet ingredients plus one cup of flour in the biggest pot I have, which is one of my gramma’s old aluminum pots that I would NEVER cook in (because, aluminum) but it’s fine to use for bread dough. 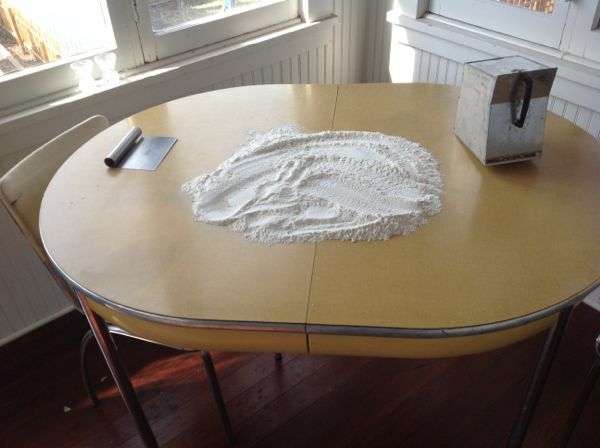 At that point, I pour the goop out onto the table that has the rest of the flour. Now, my gramma always prided herself on the fact all of her loaves where the same size. I’ve tried to do it scientifically with a scale, and other years I just eyeballed it. No matter what I do, mine never come out as even as hers. I’m told the Easter Bread champ of the family was Zia Gaetana DiMasi, my gramma’s aunt. Her bread was delicate, not as sweet and absolutely beautiful. I never had a chance to try it. By the time I met Zi’Gaitan, she was pushing 100 and always falling asleep in her chair. “Just resting my eyes,” she would say. You have to bake the loaves as they’re ready and not all of them are ready at the same time…and thank heavens because my oven isn’t big enough. The loaves are supposed to be iced (which hides my over browning) but I usually do that last minute because it can get messy. Towards her later years, my gramma just kept a tub of pre-made cake icing and used it like butter. The bread is meant to be toasted, buttered and enjoyed. Some of us have toasters dedicated to Easter Bread because the icing can get all over and make a mess…which, come to think of it, may be why my gramma started with the pre-made cake icing applied AFTER the toasting. Hmmmmmm. Anyway, whatever you don’t want to eat can be frozen or given away to only the most deserving of souls. 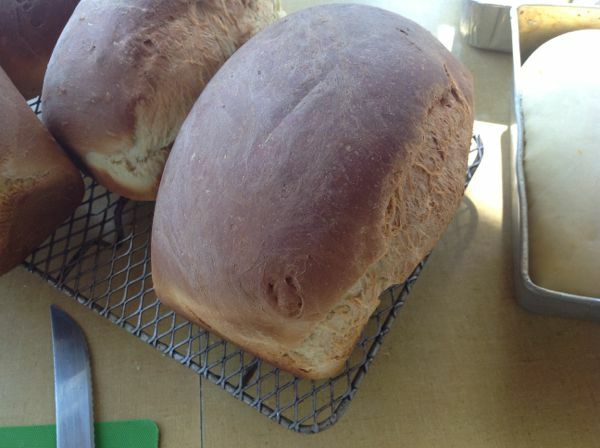 Three of my loaves are spoken for already and I’m sure I’ll find homes for the rest of them. Last year’s batch, I had one loaf that I ended up eating in August and it was just fine. 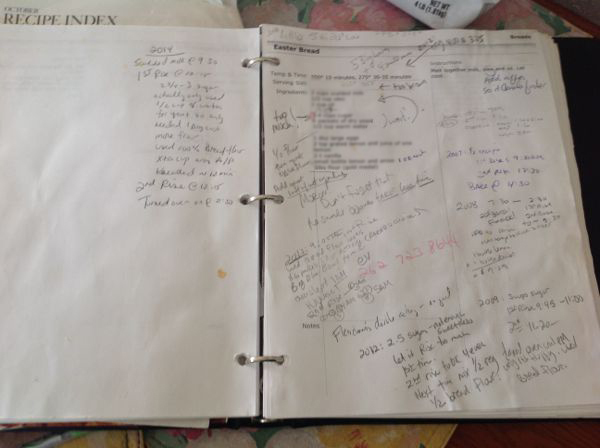 Now this is place where you would typically find a recipe, but my family is weird with recipes, hence the intentional blurring of the recipe above and the whole secret ingredient thing with the rice pudding nobody knew about until my gramma was well into her 80s. 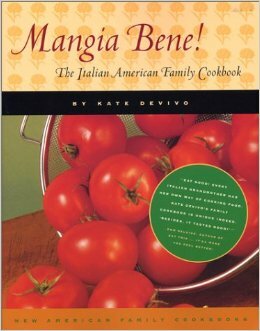 BUT, you can buy my cousin’s cookbook on amazon. It has Zia Gaetana’s Easter Bread recipe (which I personally don’t use) and everything else I’ve mentioned and then some. That way, she’s the one that gets yelled at (again) for divulging the recipe. This entry was posted in Uncategorized by Roxanne. Bookmark the permalink.